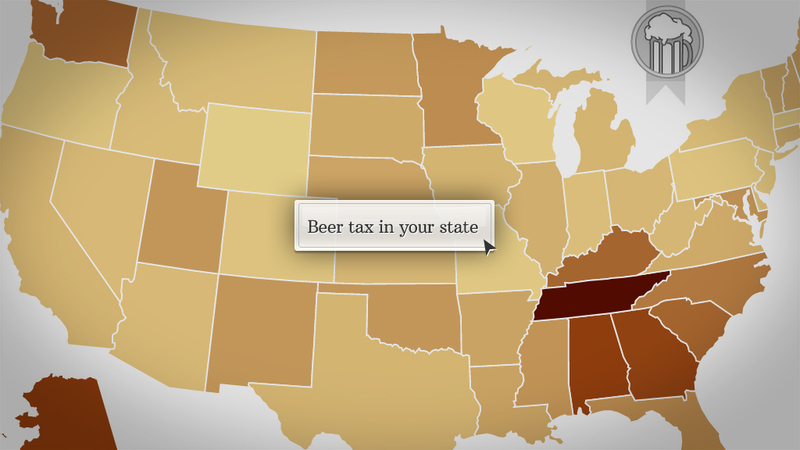 Click on the map above to see how much your state charges in beer taxes. Every state imposes a tax on beer, but the amount each state charges varies widely. Buy a six-pack of beer in Tennessee and you'll pay 66 cents towards state beer taxes. Yet, right across the border in Missouri, the tax drops to mere pennies. With a state excise tax of 6 cents per gallon of beer, or three cents per six pack, Missouri -- home to Anheuser-Busch (BUD) -- has one of the lowest beer taxes in the nation. Tennessee, which happens to be the heart of whiskey country, claims the top spot, due to combined excise and wholesale taxes that push the tax burden for consumers to $1.17 per gallon, or 66 cents per six pack, according to the Tax Foundation's analysis of beer-specific statewide taxes. In contrast, the state's taxes on spirits -- including whiskey -- rank 30th in the nation. Other states with the highest beer taxes include Alaska ($1.07 per gallon), Alabama ($1.05) and Georgia ($1.01), which charge more than 50 cents in taxes on a six-pack. Meanwhile, the lowest taxes are in Wyoming, a generally tax-friendly state which levies only two cents in taxes on a gallon of beer or one cent per six pack. Other low beer-tax states include Wisconsin and Colorado, the respective birthplaces of Miller and Coors brews. Sometimes dubbed "sin taxes," excise taxes are selective taxes on specific goods and activities, such as cigarettes, gasoline and indoor tanning services. Beyond raising revenue, excise taxes are often aimed at decreasing consumption and paying for government services related to the product. For example, gasoline taxes help fund road and highway repairs. Beer lovers not only indirectly pay a state beer tax, but they may also face a local excise tax as well as a federal excise tax of about 58 cents per gallon (for large brewers), or about 33 cents per six-pack. All of this is in addition to any state and local sales tax that is charged whether the beer is bought at a grocery store or a favorite pub. And some states tack on case or bottle fees and other special sales taxes specifically targeting alcoholic beverages. Excise taxes are typically paid by brewers and distributors before the beer reaches store shelves so they won't show up on a receipt like a sales tax, but consumers still feel their effects. "A higher tax on beer is going to make for a higher price on beer," said Scott Drenkard, an economist at the Tax Foundation. The difference adds up. Buy a six-pack once a week for a year in Tennessee and your purchases will have included around $34 for state taxes. In Missouri, less than $2 in state beer taxes would be included in the same purchases. While the way Tennessee's wholesale beer tax is charged is slated to change in July, the tax rate will remain among the country's highest. Related: Are you paying the iTunes tax? Anti-drunk driving groups and other advocacy groups argue that other states should raise outdated beer tax rates to help reduce consumption and pay for prevention and healthcare programs. Wyoming, for instance, hasn't raised its beer excise tax since 1935, two years after the end of Prohibition, while Pennsylvania's dates back to 1947, according to Alcohol Justice, a self-proclaimed industry watchdog that argues that all state beer taxes are too low. The brewing industry counters that beer is already one of the country's most heavily-taxed goods. Including federal and state business taxes, taxes make up 40% of beer's retail price tag, according to The Beer Institute, an industry trade group. Similar to sales taxes, beer taxes are regressive, meaning that they hit lower and middle-class consumers the hardest, the institute argues. 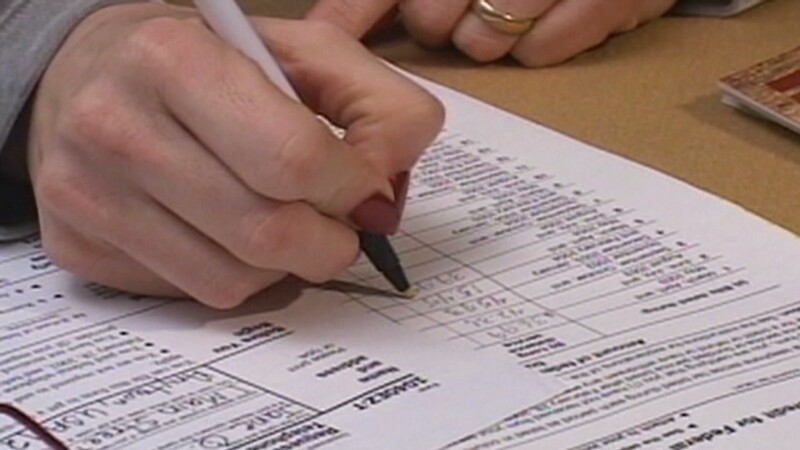 "This is an invisible tax that consumers don't know they're paying," Beer Institute President Joe McClain said in a March 2013 audio interview posted on the group's website. "The people who enjoy beer the most, those middle-class Americans, are feeling the bite of that tax more."